1. SIZE- a pearl’s value is often dependent on size, with larger ones being more valuable. The classic size is 7 mm. Larger pearls are typically produced by older, more mature oysters. 2. SHAPE- how round the overall pearl appears. 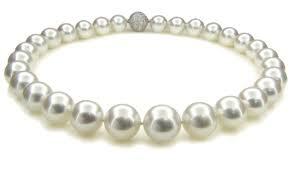 The more perfectly round, the better, although there are different breeds of pearls. For example, Baroque pearls are irregularly shaped, though very nice. 3. LUSTER- this is the iridescent glow that radiates from a pearl. It is determined by the thickness of the nacre and lack of surface blemishes. 4. COLOR- depending on the type of pearl, they appear in a variety of colors, though color should be even across all surfaces. Pearls can come in white, cream, pink, silver, black, and gold. Depending on luster they can appear green, blue, or even rose. 5. MATCHING- if strung, all pearls should be as close to the same size, unless it is a graduated necklace, in which case they should be very precisely graduated. Pearls are an organic gem that form in the soft tissue of a mollusk. The gem that results can be beautiful, rare, and certainly a treasured piece of jewelry.